Summary: Cavernous hemangiomas occur very rarely in the cavernous sinus and are difficult to diagnose preoperatively. MR images obtained in five patients with surgically verified cavernous hemangiomas in the cavernous sinus were reviewed. MR images showed hypointensity on T1-weighted images and well-defined hyperintensity on T2-weighted images with marked homogeneous enhancement after contrast material administration. We report the characteristic MR imaging observations for these lesions. Extraaxial cavernous hemangiomas are rare and very rarely arise in the cavernous sinus (1–5). Diagnostically differentiating hemangiomas from tumors such as meningiomas or schwannomas at this site is often difficult (5). 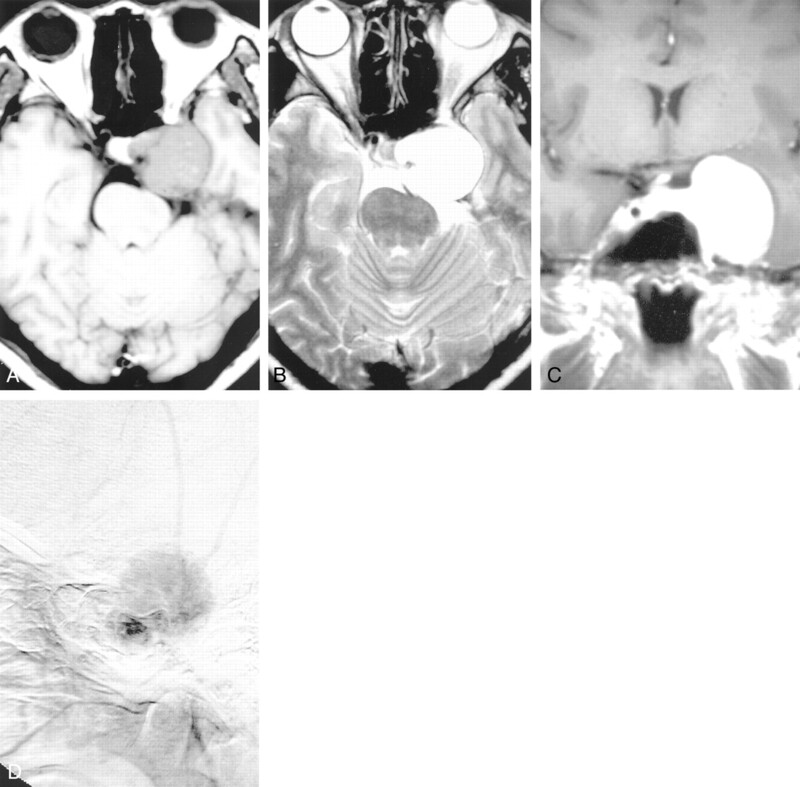 We report the MR imaging findings of five cavernous hemangiomas located in the cavernous sinus and compare the radiologic findings for this lesion with those for other cavernous lesions reported in the literature. We retrospectively reviewed the radiologic findings for five patients (four women and one man; age range, 36–57 years) with surgically confirmed cavernous hemangiomas of the cavernous sinus. All patients underwent brain MR imaging, and four underwent cerebral angiography. MR imaging was carried out in all instances with a 1.5-T system (Vision; Siemens Medical, Erlangen, Germany). All MR studies consisted of three axial T1-, T2-, and contrast-enhanced T1-weighted sequences and coronal or sagittal contrast-enhanced T1- and T2-weighted sequences. Cerebral digital subtraction angiography (DSA) was performed at both the internal and external carotid artery. In three patients, CT studies were performed in the axial and coronal planes without and then with iodinated contrast material administration. All patients subsequently underwent surgical removal of their lesions, and the lesions were then examined histologically. The radiologic findings are summarized in the Table. In all patients in whom MR imaging was performed, cavernous hemangiomas appeared as well-demarcated, homogeneously hyperintense lesions on T2-weighted images, and the lesions were hypointense to white matter on T1-weighted images (Figs 12). On contrast-enhanced T1-weighted images, all of these lesions were homogeneously and densely enhanced (Figs 1, 2). On T2-weighted images, the signal intensities of these lesions were remarkably high and homogeneous, although some linear septum-like low signal intensities were identified. No surrounding rim of decreased signal intensity suggestive of hemosiderin deposits was observed in any patient. Three of the large cavernous hemangiomas encircled the cavernous portion of the left internal carotid artery (ICA). A 37-year-old woman presented with diplopia for 2 months. MR images show that the mass produces low signal intensity on axial T1-weighted (A) and a homogeneous and markedly high signal intensity on axial T2-weighted images (B) and is strongly enhanced after contrast material administration (C). The mass is located in the left cavernous sinus, extends to the middle cranial fossa, and encircles the left ICA (arrow). Angiography of the lateral projection of the external carotid artery reveals some vascular blush that is supplied by the middle meningeal artery in the venous phase (D). A 36-year-old woman had a 7-month history of extraocular muscle limitation and visual disturbance. MR images reveal a large, lobulated mass, with compression of the right cavernous sinus. The mass encircles the cavernous portion of the left ICA (arrow). It gives low signal intensity on T1-weighted images, homogeneous markedly high signal intensity on axial T2-weighted images (A) and is strongly enhanced after contrast material administration (B). Angiography of the left lateral projection of the ICA reveals some vascular blush that is supplied by the meningeal branch of the artery (C). On CT scans, the lesions of three patients appeared as well-demarcated, homogeneous isointensity or minimally hyperattenuated areas with strong homogeneous contrast enhancement and showed pressure erosion of the petrous bone. Three patients had delayed and persistent fine vascular staining on their cerebral angiograms (Figs 1 and 2), and an avascular mass was observed in one patient. Cavernous hemangiomas are defined as vascular malformations consisting of abnormal, dilated vessels within intervening neural tissue, according to the Armed Forces Institute of Pathology, Korea Medical University, Keimyung University, Dong-san Medical Center. Intracranial cavernous hemangiomas are one of the four most common types of vascular malformation. They can be isolated or multiple. In the latter type, they are often familial, with autosomal dominant transmission. They occasionally have the appearance of a tumor through confluence of multiple hematomas. They can occur in all parts of the central nervous system but occur most commonly in the cerebral hemispheres, with the clinical features being seizures and bleeding (6). Other names also have been used to describe these lesions, including cavernous angioma, hemangioma, cavernous malformation, and cavernoma. Extraaxial cavernous hemangiomas have the same histologic features as intraaxial lesions, but the former have different clinical pictures, natural history, and radiologic findings (7, 8). Although this malformation is categorized as a vascular malformation and has well-defined histologic characteristics, it sometimes presents tumorlike behavior, including mass effects, enclosure of neurovascular structures, and proliferation during pregnancy (9). The most likely growth mechanism is considered to be progressive ectasia of the blood vessels or their autonomous development at the edges of the lesion; hemorrhagic onset is much rarer in hemangiomas of the cavernous sinus than in the intraparenchymal variety (2, 9). The lesions are found predominately among women, and four of our five patients were women. The onset of symptoms is usually insidious, and symptoms are caused by the large size of the lesions. Patients usually present with headaches and dysfunction of the cranial nerves passing through the cavernous sinus, manifesting particularly as ptosis and diplopia. Facial numbness or neuralgia may occur if the gasserian ganglion and second and third cranial nerves are involved. Optic acuity is decreased when the optic nerve is compressed (10). Cavernous hemangiomas in this area tend to grow as asymmetrical dumbbell-shaped masses occupying the middle cranial fossa and sellar regions. MR imaging reveals well-defined masses that are hypointense or isointense on T1-weighted images and markedly hyperintense on T2-weighted images, which indicates the relationship between the lesion and the intracavernous ICA. The marked hyperintensity on T2-weighted images and homogeneous enhancement seem to distinguish these lesions from other types. Meningiomas often give similar signal intensity to gray matter on both T1- and T2-weighted images. Schwannomas tend to give lower signal intensity than gray matter on T1-weighted images and almost uniformly give higher signal intensity on T2-wighted images. Both schwannomas and meningiomas show prominent contrast enhancement, which tends to be a slightly heterogeneneous pattern. We reviewed 35 cases of cavernous hemangiomas in the cavernous sinus in the literature (1, 2, 4, 7, 11). All but one of the 35 cases had high signal intensity on T2-weighted images with strong homogeneous contrast enhancement. All five of our patients had similar MR imaging findings. In our experience, these combined MR imaging features are very helpful to distinguish cavernous hemangiomas from other intracavernous masses such as meningiomas and schwannomas. Contrast-enhanced MR imaging revealed a well-defined lesion border, which was the lateral wall of the cavernous sinus. CT scans showed nonspecific features of expanding intracranial masses, such as hyperattenuated or isoattenuated masses that exhibited attenuated homogeneous or inhomogeneous enhancement (12). In our patients, however, all showed attenuated homogeneous enhancement on contrast-enhanced CT scans. Cavernous hemangiomas exhibit a high degree of vascularity, and angiographically detected vascular blush has been reported for 80% of patients (10). Shi et al (9) reported only a vague vascular blush in the late venous phase for two of five patients. Some vascular blush in late arterial and venous phase was observed in three of our four patients evaluated by DSA. According to Shi et al (9), these lesions seem to exhibit two subtypes. In four patients with subtype A undergoing biopsies in their study group, the lesions were soft with very high tension. They collapsed while being compressed and immediately bulged during relaxation. Puncture of the lesions yielded reddish blood. When the lesions were opened, severe bleeding occurred immediately. Pathologically, this subtype was composed of large numbers of thin-walled vascular sinusoids, with a single layer of endothelium-lined capillaries. Between the large lumens of the vessels, connective tissue was scanty. In the subtype B group, which included six patients who underwent total or partial removal in this study, the lesions were slightly hard and mass pulsation was not obvious. Pathologically, these masses contained ample solid parenchyma and well-formed vasculature and connective tissue. Although cavernous hemangiomas are well demarcated with a fibrous pseudocapsule, the perioperative mortality rate is very high as a result of uncontrollable bleeding, with a death rate of 12.5% among the 65 patients reported (9). Thus, because these lesions require a different surgical approach and technique, correct preoperative diagnosis is very important. In our and other reported patients, intracavernous cavernous hemangiomas give high signal intensities on T2-weighted images, with a strong homogeneous enhancement on contrast-enhanced T1-weighted images supporting the diagnosis. Accepted after revision November 5, 2002.